In the market for a new vehicle, and looking for something with above-average interior space in addition to sporty performance? 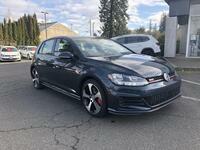 The 2019 Volkswagen Golf GTI in McMinnville, OR has you covered. This four-door hatchback seats up to five passengers comfortably and received an additional eight horsepower for the 2019 model year. Drivers can choose between four trim levels of the 2019 Volkswagen Golf GTI. These trims are titled S, Rabbit Edition, SE and Autobahn. Of these four models, the Rabbit Edition is the only one new for the 2019 model year. The Rabbit Edition is a limited-run trim and features unique branding, exclusive exterior color options and several standard driver assistance features such as blind-spot monitoring and automatic emergency braking. The 2019 Volkswagen Golf GTI shares the same engine across all four trim levels. This turbocharged, four-cylinder, 2.0-liter engine generates 228 horsepower and 258 pound-feet of torque. Either a six-speed manual or a seven-speed dual-clutch automatic transmission (replacing last year’s six-speed automatic) can be paired with this engine. This hatchback also utilizes a sport-tuned suspension system to improve vehicle handling, ride quality and road grip. Other than its performance ratings, there are plenty of other reasons to purchase a 2019 Volkswagen Golf GTI, such as its storage capabilities. Maximum cargo capacity for the 2019 Golf GTI is 52.7 cubic feet and a standard cargo capacity of 22.8 cubic feet. These ratings place the 2019 Golf GTI above most of its competitors in terms of storage. 2019 Volkswagen Golf GTI safety features include: An intelligent crash response system, a tire pressure monitoring system, LATCH child seat anchor points, anti-slip regulation, electronic stability control, engine braking assistance, an anti-lock braking system, electronic brake-pressure distribution, side curtain protection head airbags and a crash-optimized front end.